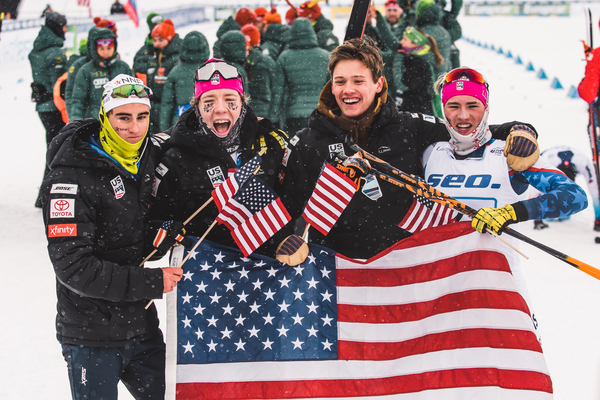 In a historic first for the U.S., the U20 men’s team won the 4 x 5-kilometer relay today in Lahti, Finland at the 2019 World Junior Ski Championships. Luke Jager skied the first classic leg for the U.S., Ben Ogden skied the second classic, Johnny Hagenbuch skied the first initial skate leg and Gus Schumacher raced the anchor leg. The foursome won in a time of 45:34.7 minutes, and beat second-place Russia by 3.8 seconds. Russia’s team was comprised of Egor Trefilov, Andrey Kuznetsov, Yaroslav Egoshin, and Alexander Terentev. Germany’s team of Jakob Milz, Florian Knopf, Anian Sossau, and Friedrich Moch took third finishing 6.3 seconds behind. For Canada, Remi Drolet , Sam Hendry, Xavier McKeever, and Thomas Stephen skied to 11th (+2:29.7). Nineteen teams were entered in the race. In the 4 x 3.3 k U20 women’s race, Norway’s Kristin Austgulen Fosnaes, Astrid Stav, Helene Marie Fossesholm, and Kristine Stavås Skistad won at the line in 35:24.7 minutes. Russia’s Anastasia Faleeva, Kristina Kuskova, Veronika Stepanova, and Anna Grukhvina were a close second, stopping the clock 1.0 seconds back. Louise Lindström, Frida Karlsson, Tilde Baangman, and Lin Svahn for Sweden placed third (+33.3). The U.S. team of Mara McCollor, Kendall Kramer, Sydney Palmer-Leger and Novie McCabe skied to fourth place, 40.5 seconds back. For Canada, Anne-Marie Petitclerc, Jasmine Drolet, Anna Pryce, and Molly Miller placed 11th, 3:01.4 minutes behind. In what is his skiing canvas, the 15 k freestyle, France’s thirty-two-year-old Maurice Manificat won his first World Cup of the season in Ulricehamn, Sweden today in 34:55.4 minutes. It was a tight race in that Norway’s Simen Hegstad Krüger Simen Hegstad Krüger who placed second finished 1.1 seconds back. Teammate Didrik Tønseth was third (+8.7). Canada’s Alex Harvey was the best placed North American in ninth (+31.4). Lenny Valjas skied to 57th (+2:32.1), and Bob Thompson 77th (+4:16.6). For the U.S., Scott Patterson finished 35th (+1:26.5), David Norris 53rd (+2:11.3), Ben Lustgarten 64th (+3:04.7). Norway’s Therese Johaug kept her distance win streak alive at eight wins in eight starts on the World Cup this season. She won the women’s 10 k skate race in 25:48.2 minutes, with teammate Astrid Uhrenholdt Jacobsen in second, 22.8 seconds back. Third place went to Sweden’s Ebba Andersson, 24.9 seconds behind. The U.S. Ski Team’s Jessie Diggins skied to fourth place (+38.3), while teammate Sadie Bjornsen was 15th (+1:25.1). Caitlin Paterson (CGRP) had her best World Cup result of the season, skiing to 23rd (+1:49.9). Rosie Brennan (APU) placed 28th (+2:03.2), and Rosie Frankowski 42nd (+2:28.0). In the women’s 10 k pursuit, Italy’s Dorothea Wierer won in a time of 29:20.1 after skiing two penalties (1+0+0+1). Second place went to Germany’s Laura Dahlmeier, who finished 6.0 seconds after Wierer after one missed shot (0+0+1+0). Saturday’s third place went to another Italian, Lisa Vittozzi, who finished 16.2 seconds behind the winner after tying Wierer’s shooting score. Clare Egan led the way for the U.S., racing to 11th (+1:31.9) after skiing two penalties (0+0+0+2). Joanna Reid was the next American to finish, placing 29th (+2:55.2) after three missed shots (1+0+0+2). For Canada, Rosanna Crawford finished 34th (+3:30.8) after skiing five penalties (2+1+1+1) and her teammate Megan Bankes finished 39th (+3:37.1) with five misses (1+0+3+1). Also skiing for Canada, Sarah Beaudry placed 46th (+5:07.5), also with five penalties (4+0+1+0). won in a time of 31:33.7 after skiing three penalties (1+1+0+1). France’s Antonin Guigonnat raced to second place, 34.8 seconds behind with one missed shot (0+0+1+0). The third and final podium spot on Saturday went to France’s Quentin Fillon Maillet, who skied two penalties (1+0+0+1) and finished 40.6 seconds back from the winning time. Sean Doherty for the U.S. placed 47th (+4:39.1, 3+2+1+0). Jake Brown was lapped and was not given an official time. For Canada, Jules Burnotte skied to 54th (+5:42.8, 1+3+1+1), and Scott Gow 55th (+6:39.7, 4+0+2+3). Canada’s Antoine Briand (CNEPH) was the fastest qualifier on the day in 3:14.71 minutes and won the men’s final. Dominique Moncion-Groulx (Nakkertok) placed second in the final, with Ben Saxton (SMS T2) in third. Saxton was the second fastest qualifier, with Oliver Hamel (CNEPH) third fastest. For the women, Sophie Caldwell (USST/SMS T2) scorched the qualifier in 3:40.44 minutes with Jessica Yeaton (APU/Australian National Team) qualifying in second (3:50.49). Dartmouth’s Katharine Ogden qualified third (3:51.79). Caldwell went on to win the final in 3:37.06, with Yeaton in second and Kelsey Phinney (SMS T2) in third.